Seabuckthorn fights gum disease – who knew! On March 11, 2011 Dr Oz reviewed the health benefits of the seabuckthorn oil with guest Dr. Gerald P. Curatola, an expert in rejuvenation dentistry. They discussed its role as the best secret weapon against gum and dental disease for its rich nutritional content, anti-inflammatory, high antioxidant properties, and high omega content. This is a wonderful new application for this product, and another example of the multiple uses of natural supplements. Seabuckthorn oil is an effective health and beauty powerhouse, which California Academy of Health (CAOH) started selling approximately 7 years ago, even before it was widely available and at that time not certified organic, but simply wild harvested. Seabuckthorn provides nourishing properties to the skin, hair and nails. The tiny Seabuckthorn berry, about one-third the size of a blueberry, offers a powerful combination of nutrients, vitamins and health benefits that are unmatched. The seabuckthorn berry (Hippophae rhamnoides) has been one the least publicized of all super fruits/berries, but this tiny yellow/orange jewel delivers more than 190 bioactive nutrients, is packed with antioxidants, and offers more vitamin C than just one orange. Our 100% organic, cold pressed, Seabuckthorn oil is loaded with essential omega fatty acids 3, 6 and 9. In addition, it contains omega 7 fatty acids, a rare and vital component for healthy hair, skin and nails. Seabuckthorn Oil naturally relieves dry patches of skin, acne, dermatitis, rosacea, and scars. Skin rapidly absorbs the moisture and the oil is suitable for all ages and skin types. Our therapeutic grade, certified organic oil is 100% pure with no additives or preservatives. 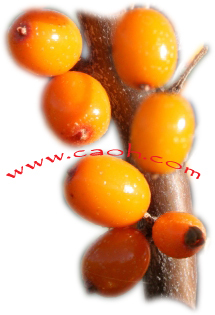 CAOH's Seabuckthorn is 100% pure and is organic, contains no preservatives, dairy, wheat, gluten, sodium or yeast. It can be used internally and externally. Note that many Seabuckthorn oils being offered are only to to be used externally! It is important to note the difference when buying! Click here to read some Seabuckthorn Lore and Facts! There are many different types of products using seabuckthorn now, but note that juice products using seabuckthorn have had much of the oils removed and even use powders to fortify their juices. This in and of itself is not bad, but the Seabuckthorn berry does not really lend itself to yummy juice. It is a hard berry that is in fact pretty bitter tasting. Seabuckthorn is not a berry you'd pluck from the vine and pop in your mouth! However, the resulting oil from the berry and seeds is really the best way to deliver the product – in fact the berry yields are between 25% and 50% oil. The resulting oil highly concentrates all of its best properties. CAOH's Seabuckthorn Oil is just two wonderful ounces of this pure oil! Many of our customers love to combine our organic Tamanu oil with the seabuckthorn oil for use topically. It is a 1 – 2 punch on dry patches of skin, acne, dermatitis, rosacea, and scars. Additionally, our seabuckthorn oil is a great oil to mix with our organic oregano oil – it helps to tone down the taste and strength of the oregano oil. ← Could you please advise if there are any synthetic versions of vitamins in Kidamins?